I enjoyed this slim, illustrated middle reader novel far more than I expected. In all honesty, the publisher sent me this book along with another than I had specifically requested. I had no qualms about trying it, but wasn’t expecting it would align with my tastes and found myself surprised when I enjoyed this one even more than the one I requested. The story follows young Toletis, each chapter focusing on a significant moment in his life, and united more by theme than overt storyline, the theme being, foremost, environmental battles. I really liked Toletis, and his friends. They’re mature, but not unbelievable; I’ve met countless children who surprise me with wisdom beyond their years. The story also has an appealing dreamy tone, a tall tale feel with folkloric hyperbole and metaphor. 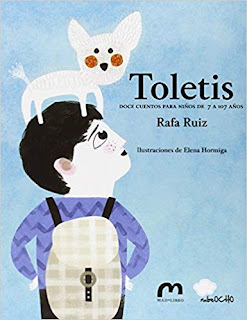 TOLETIS juxtaposes the hope of the young against the cynicism of those older, and in so doing manages to instill some of that youthful hope in its readers. This book is a must for any fairy addict. It could as well be called The Encyclopedia of Fairies for that’s what it feels like: a half page to two pages each devoted to numerous types of and lore regarding the fey. I will say that the approach, with regards to the tone, was a little too spiritual for me, but perhaps better explains the choice of Bible over Encyclopedia in the title. 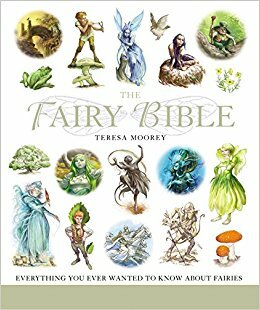 I genuinely couldn’t tell if the style was a gimmick or sincere, but the book is written with the understanding that fairies are real. It speaks of science closing our minds to magic and includes specific rituals for summoning fairies or finding fairyland. Numerous times, the book refers to itself more as a “field guide,” to be utilized during one’s search for fairies. While leaning towards the notion that this approach is more tongue in cheek (but not entirely convinced), I regardless find it annoying and distracting. I would have much preferred an objective overview of fairy folklore, something presented with analysis but minimal speculative judgment, more like an anthropologist’s approach. It’s also sometimes a stretch what they call a fairy, but for me that wasn’t a problem; I’m interested in pretty much of every branch of mythology, folklore, etc. I don’t consider a valkyrie part of the fey, though, for example. This book is perfect for reading in little snippets given the brief sections focused on one specific topic. And, of course, you can easily read it out of order. This novel follows teenage Butterfly through typical adolescent issues shadowed by darker themes of political tension and occupation in the Middle East. Butterfly’s voice is amazing, distinctive and convincing. I found myself glued to the page, because I could almost imagine Butterfly herself telling me all this, the flow a cross between conversational and storytelling. At under 100 pages, the book felt underdeveloped to me. I enjoyed it, but felt it ended as soon as it began. The story made me feel, but didn’t have has much plot structure as I wanted. Also much more info is relayed through subtext than stated explicitly, which left me feeling this book benefits most from a very close reading. 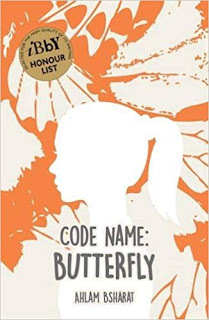 Though CODE NAME: BUTTERFLY left me wanting more, Butterfly’s voice stands out among the wealth of complex themes packed so tightly into such a slim novel. Teenage Ellie is an archery champion, in the running for a future with the Olympics. However, her success is dampened by the loss of her brother Rob, also an archery legend. 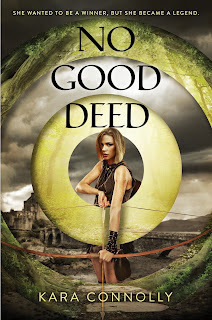 Ellie’s specific skills with a bow and arrow come in handy when, logic aside, she finds herself thrown into the Sherwood Forest of the past, unintentionally playing Robin Hood. Time travel is not usually my taste, but I think the same reasons this worked for me might be criticisms to others. Let me explain. 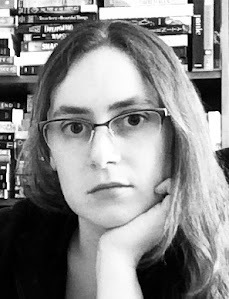 Connolly uses time travel as the catalyst, but the science (or magic) is not explained. This works perfectly for me, because I most care about the characters and how they handle the catalyst anyway, and also almost every attempt at explaining time travel only further unconvinces me (explaining why I don’t particularly like the sub-genre). Connolly addresses some key questions quickly and efficiently, such as language barriers, but then focuses on what’s really important: the story. Time travel stories can be vastly different, with potential for both serious and silly approaches. Connolly manages to ride that line and do both. There’s an underlying threat of danger fitting for the period, but the story doesn't swerve into any horrific directions that it certainly could. And the abundance of playful banter and silly snark adds a lighthearted layer to the adventure. NO GOOD DEED is a fun read with the feminist twist of a female Robin Hood figure.